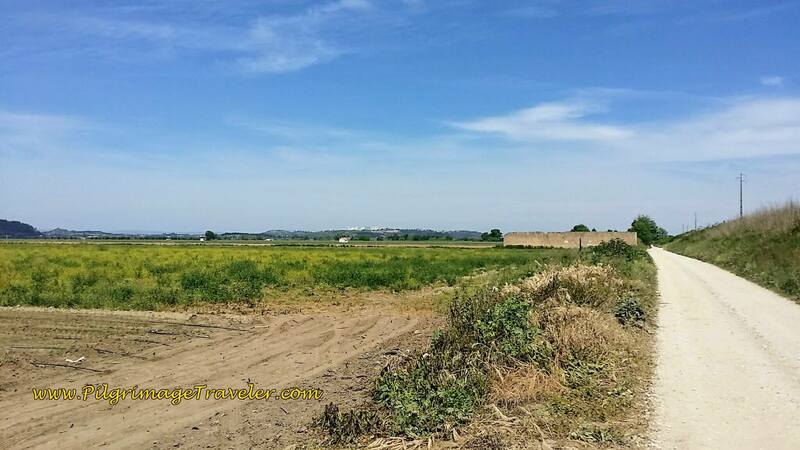 Our day three on the Camino Portugués was through miles and miles of fertile, open farmland north and east of Azambuja. 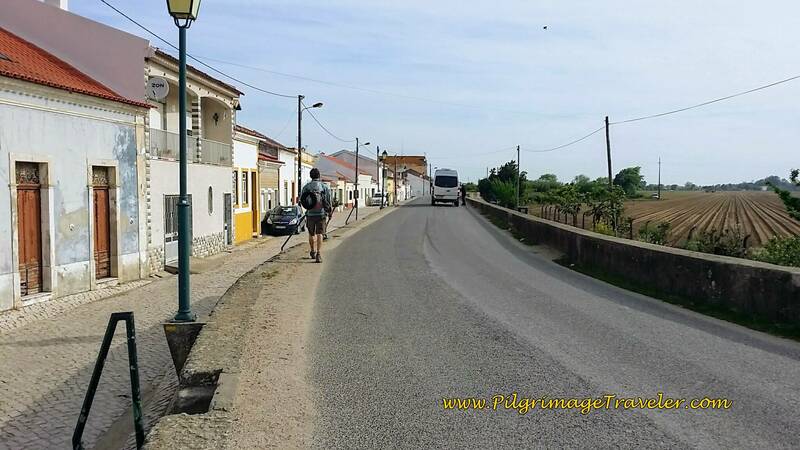 The day was hot, dry and with a steep uphill climb into Santarém at day's end. 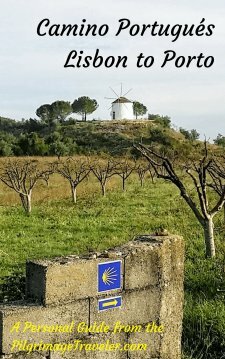 It was to be a difficult and long day, one that would challenge even this experienced pilgrim's resources. It was indeed a day to get to know myself better. Here is my Google map that I created from my geotracker app. I included the stops we made along the way, for food and accommodation. 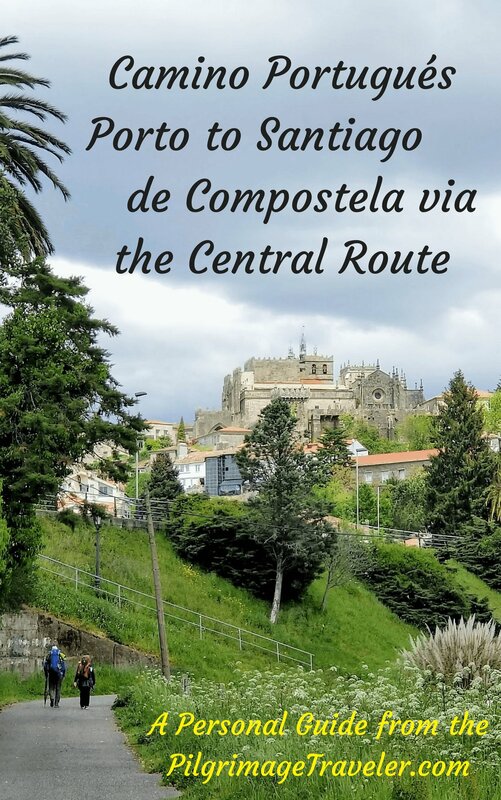 If you are interested in seeing the above route with all our photos superimposed, please click on this link: Day Three Camino Portugués Route with Photos. We started our day at the Café Tatlana, the same place we had dinner on day two. The proprietress, ultra-pilgrim-friendly, served us at 7:00 a.m. so we could get an early start to beat the heat. While her son from the prior evening was fluent in English, she didn't speak a lick! Somehow we managed to communicate, with me speaking in mostly Spanish. She made us sandwiches to carry out, since this leg has very little services, and none after Porto Muge. We were happy and content to have plenty of food for this day, when we set off. Our Swiss friend joined us for pastries and café con leite. 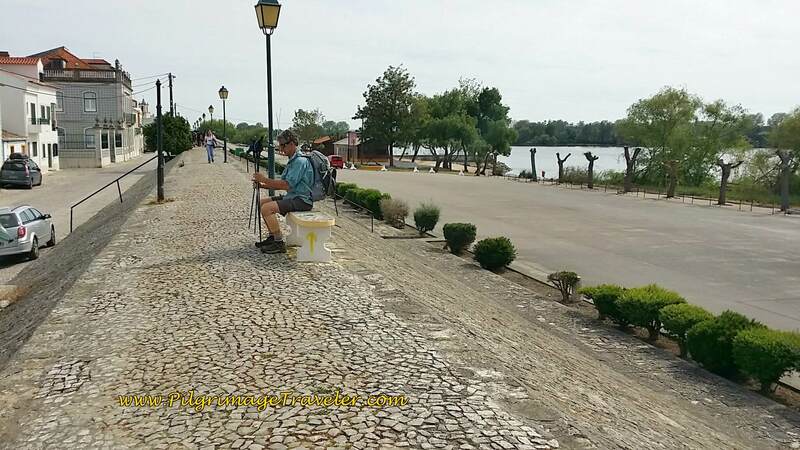 He sadly informed us that he would not be walking with us today, but was going to take the day off and take the train to Santarém. His reason was that it was too hot to walk. We had expected this, and agreed to meet up in Santarém later. He would spend the day relaxing around town and hopefully, he would feel better tomorrow. We were not unhappy, and looked forward to walking, just the two of us. After receiving hearty hugs and Bom Caminhos from our "Camino Mother," Rich and I began our day. We crossed over the railroad tracks at the Azambuja train station, below. After crossing the tracks, the day immediately begins on the pavement, on the N3-3. 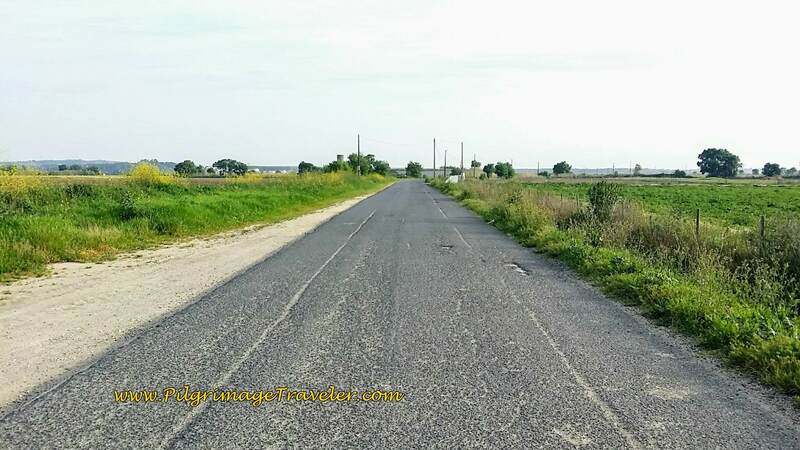 For many kilometers we will join the N3-3, then divert, only to rejoin it again on the way to Valada, where we planned our first break after about 13 km. After about 2 kilometers, you reach this bridge, with the sign below. and leads you sharply left and back toward the bridge on this lane, below. 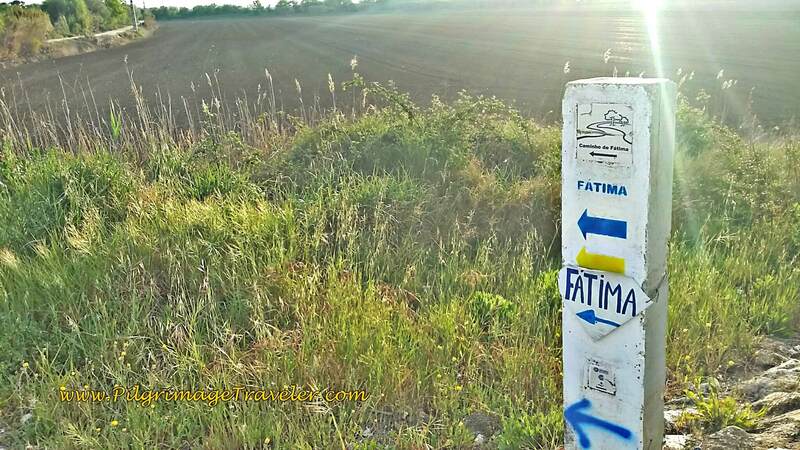 You can see the prominence of the Fátima waymarking, and the small yellow arrow for the Camino de Santiago. 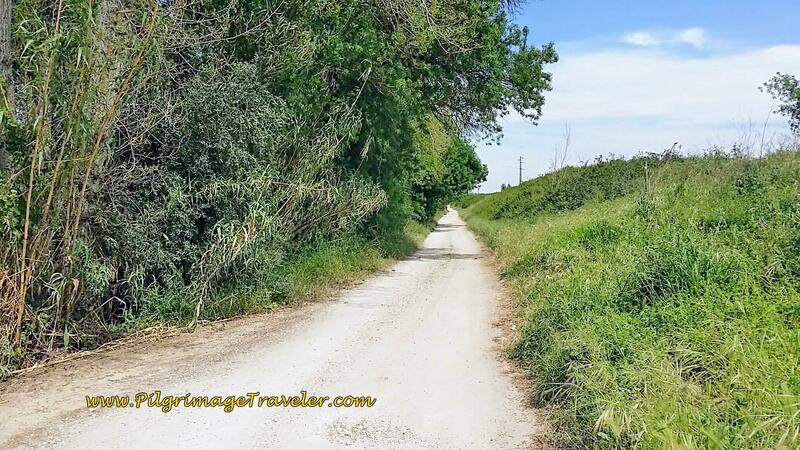 The paths and tractor lanes we followed next were lovely and inviting, and if you look closely, you will see the herd of horses, following along the irrigation ditch to the right. They were skittish and would not stop to even look at us. The shortcut diversion from the N3-3 on these farm lanes, was nice enough, as the morning was still cool. Here is Rich posing for me in the wide open spaces. 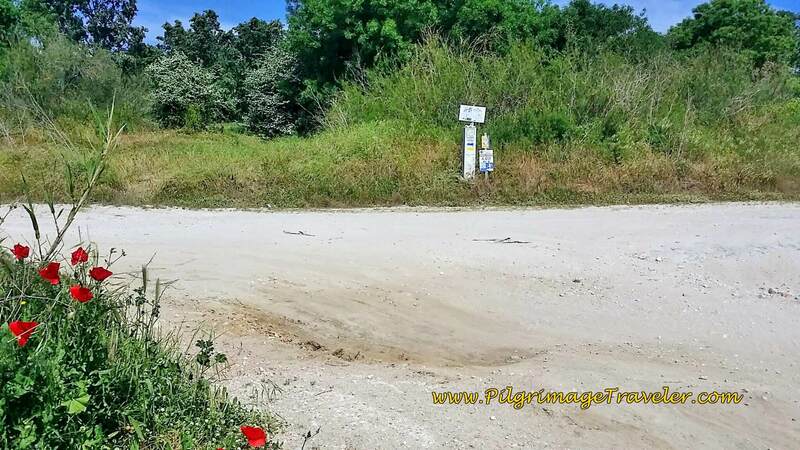 After approximately another 2-3 kilometers, the gravel road led us to a small airport, the Aeródromo de Alqueidâo on the map. The airport is up ahead at the cluster of buildings. When we reached the buildings, and the entrance to the airport to the right, the lane comes to a T-intersection and joins the N3-3 again. The sign points left to Valada, our destination for our first break. We were not all that thrilled to be joining the pavement. The road ahead appeared long and open and day three was warming up rapidly. We knew we had a full 13 or so kilometers to the first café in Valada. As Rich and I walked alone along this seemingly never-ending stretch of pavement, we discussed the situation regarding our Swiss friend. While we were relieved to be free of the "Barnacle," at least for the day, he had been our only companion on the Camino thus far. We did truly feel sorry for him. We really couldn't tell if he was happy to be taking a day off, or not. On the one hand, he was very cavalier and then turned stoic on the prior two days. 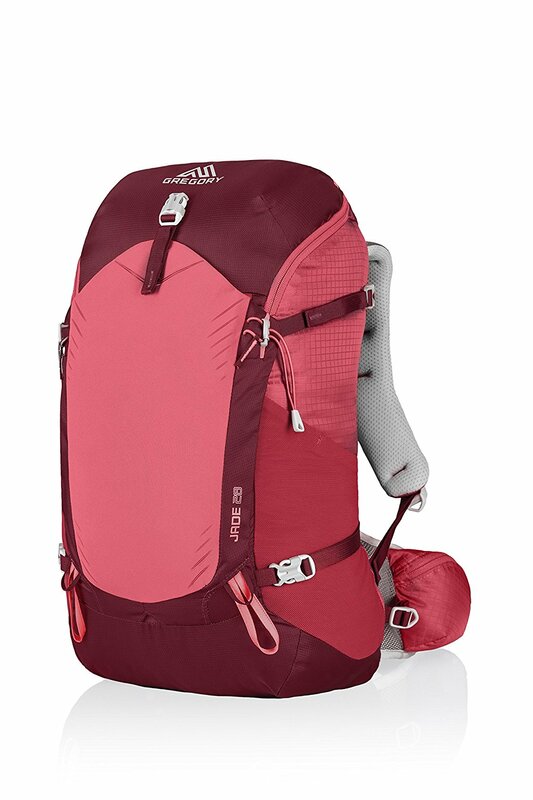 When we discussed the weight of his pack and asked him when he was going to mail some things back to Switzerland, he would just look at us and not reply. 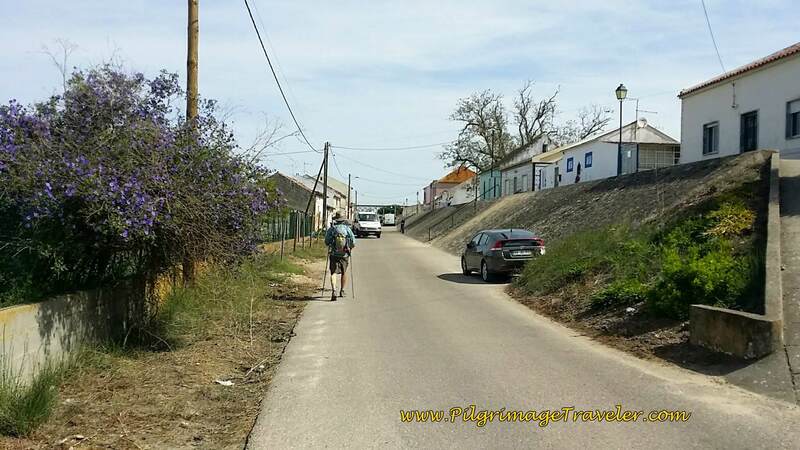 Yet on the other hand, he appeared to want to meet the physical challenge of the Camino. He was used to the Alps and loved to hike them. It was obvious that our Swiss friend did not like to be wrong about things. He never sought our advice. 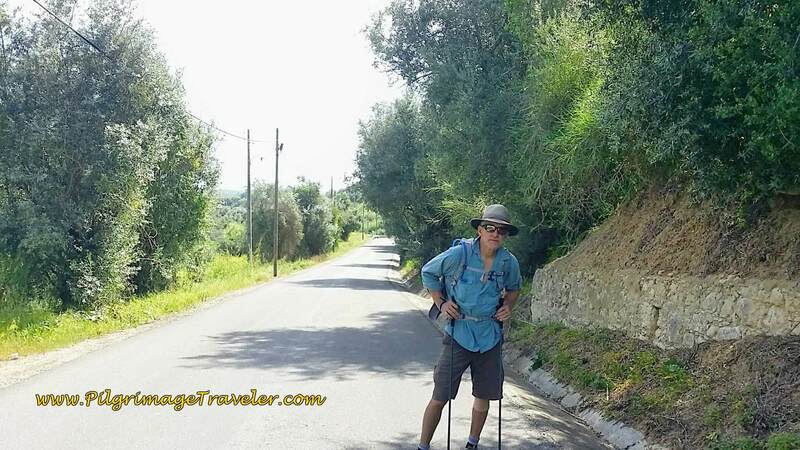 He was very instructional with us, on how to use our hiking poles in a Nordic walking fashion and with other hiking tidbits. He was also quite opinionated and somewhat set in his ways. 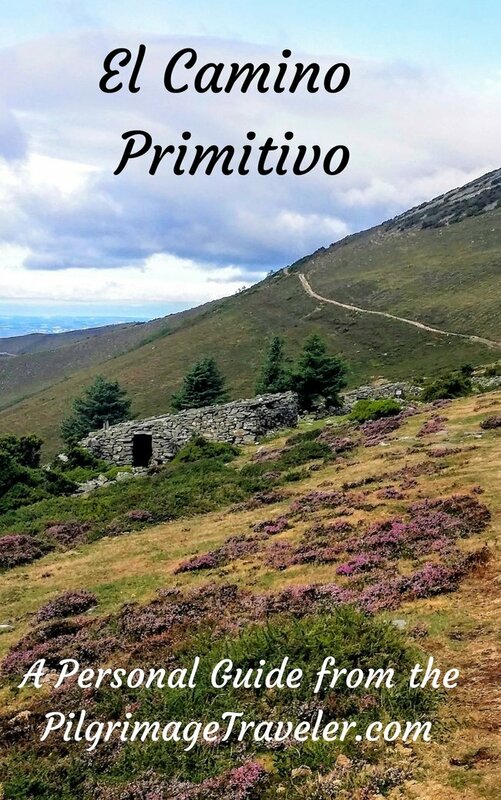 He freely expressed his dislike of the lack of cleanliness on the Camino, with dogs roaming freely and leaving their marks on the trail, in addition to visible garbage. He did not appreciate the Portuguese food and never said much about what he ate. He continued to greatly appreciate the Portuguese beer over the food. 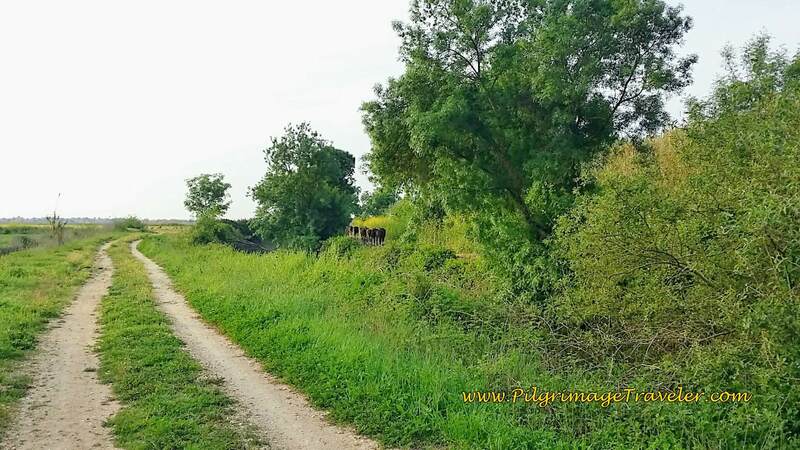 This was his first Camino, and we began to think that perhaps it was our purpose, to help him learn how to be a pilgrim, how to become more adaptable to a different way of being? We mulled this over in our discussion for awhile. We knew that we would have to tread delicately and wait for when our friend was open to learn. I was secretly hoping that I would not meet up with the Barnacle again. But I was willing to be present to him and his experience. I may have no other choice! I seem to always find myself in situations where I am to help others, whether or not I choose it. If this was my destiny with the Barnacle, it was easy enough to accept. Rich and I walked on, happy enough to be with only each others company. It was a nice reprieve. 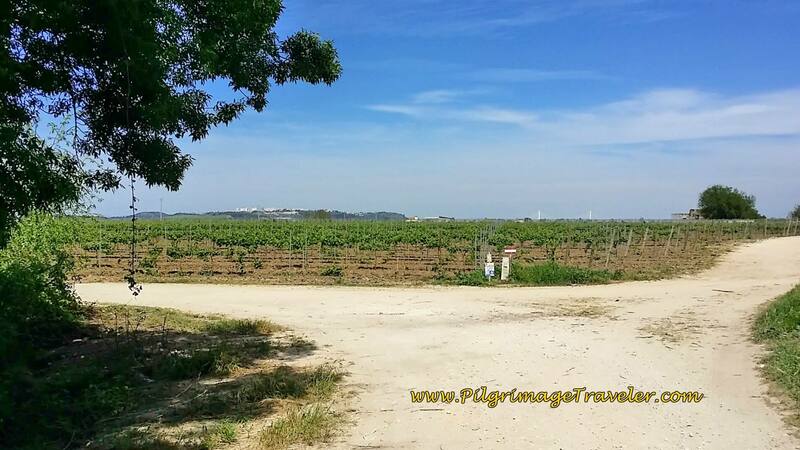 We were definitely walking through the rich farmland of the alluvial plain of the Río Tejo. 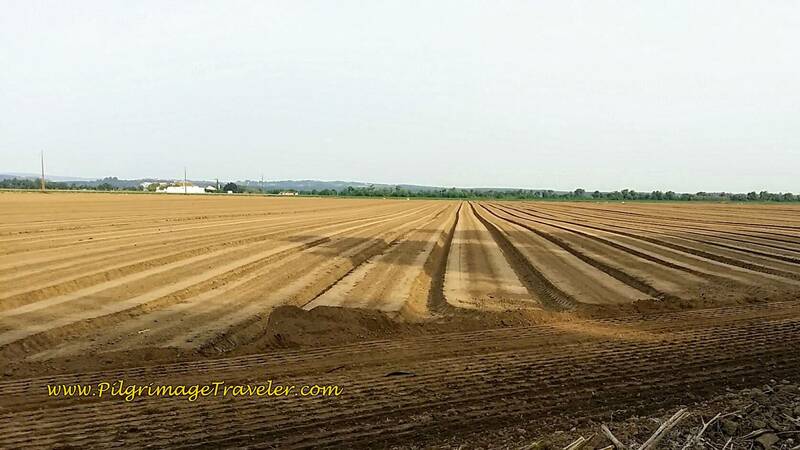 Being that it was April, the readying for planting was in full swing. 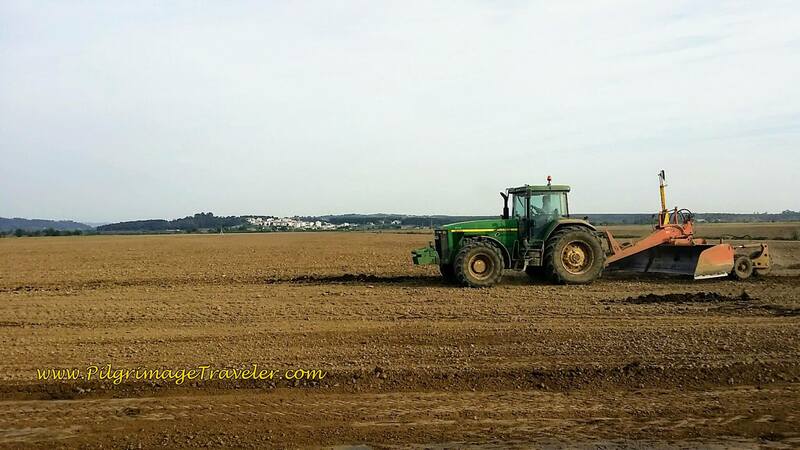 I loved to watch the farmers do their earth-work as we walked by. Here the Camino Portugués veers to the right, to stay on the N3-3. 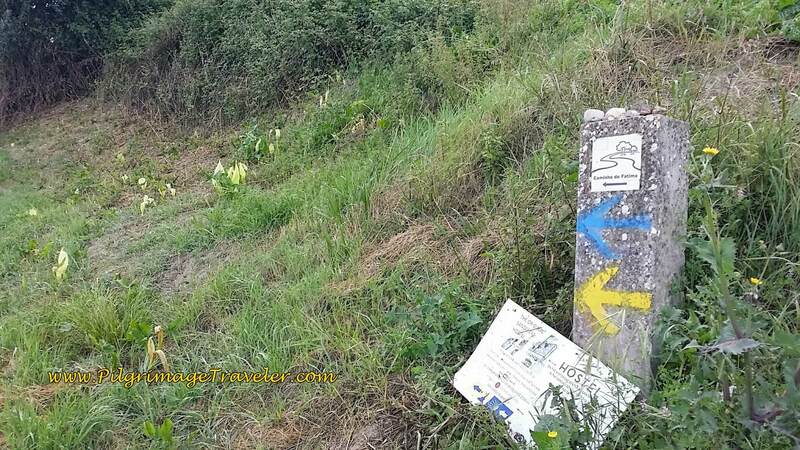 As you continue to follow the Fátima route (with the yellow Caminho de Santiago arrow), just before Reguengo, the Camino turns left to stay on the N3-3. 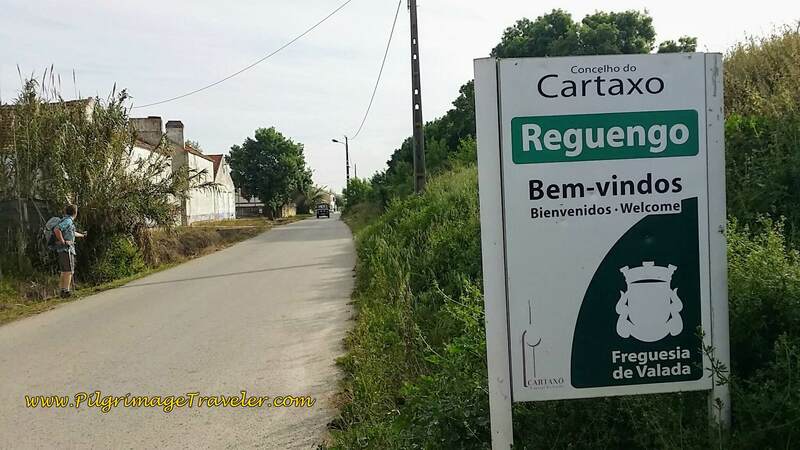 As you can see, the hostel signs start already appearing for Santarém. 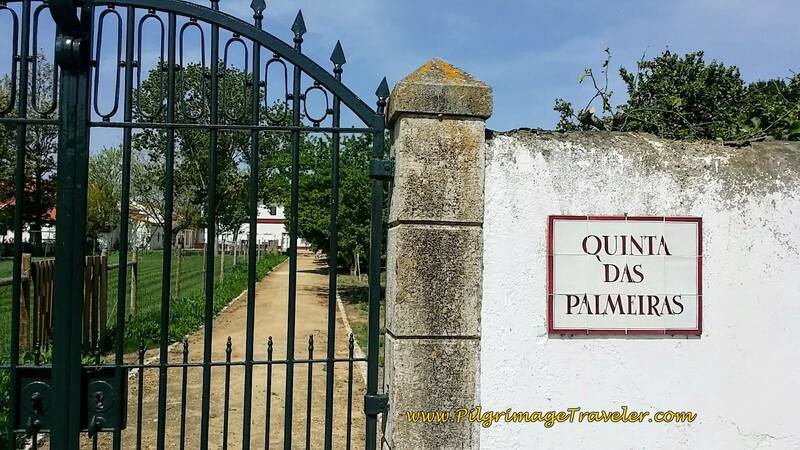 In Portugal, a large, wine-growing estate is called a Quinta. 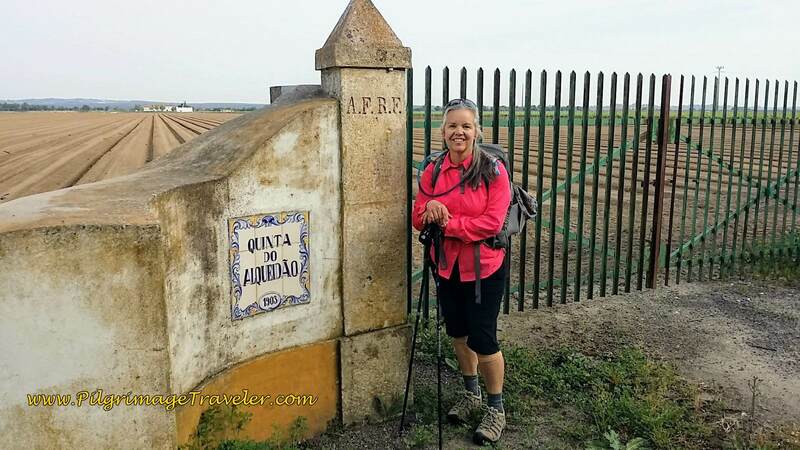 Here I am, posing in front of the entrance to the first one we walked by on day three of our Camino Portugués. The verdant countryside truly was beautiful, even if the way was long and warming up rapidly. At around 10 kilometers, we arrived at the small town of Reguengo. The sign below welcomed us! There are no cafés in Reguengo, but walking through town is delightful. 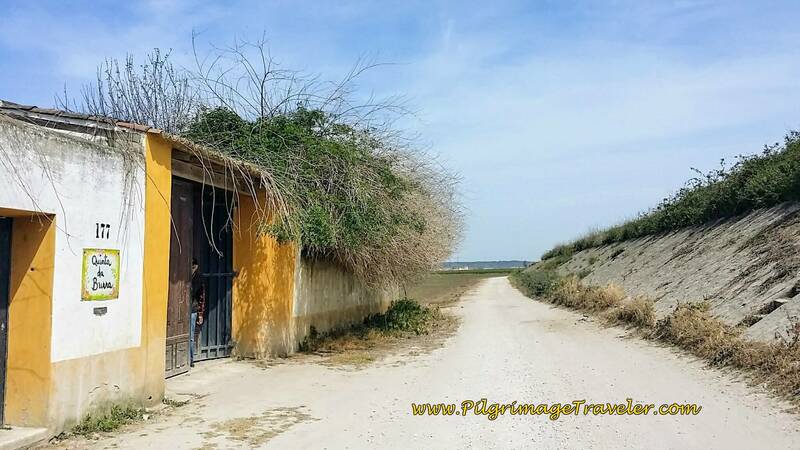 The roadway and the Camino are on the dike by the Tagus River, now ever on our right, to the East. 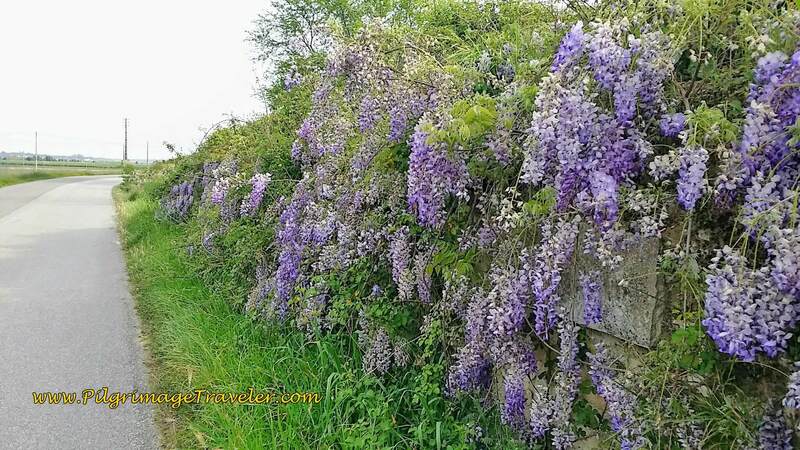 Leaving Reguengo, the Wisteria grow wild along the road. 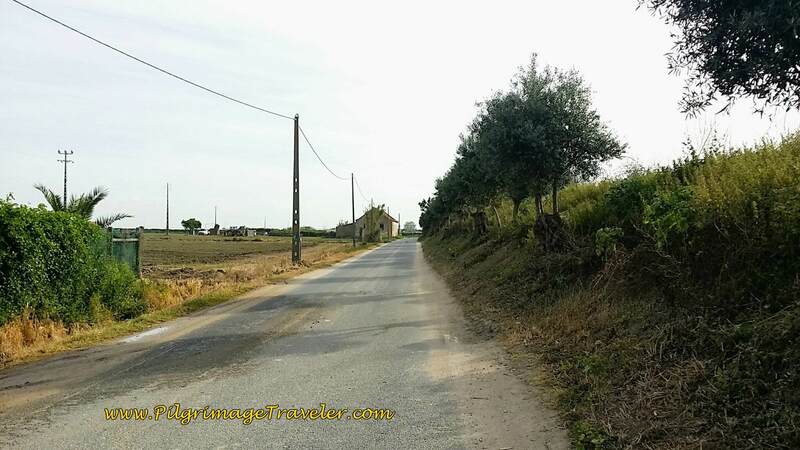 In a few more kilometers, the road forks, and the Camino Portugues bends to the right. 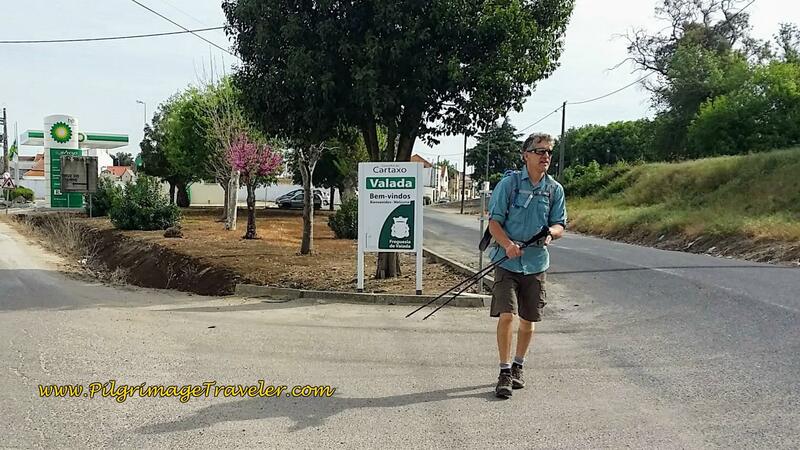 Here is Rich, at the Welcome to Valada sign. My Geotracker said we had done 13.36. 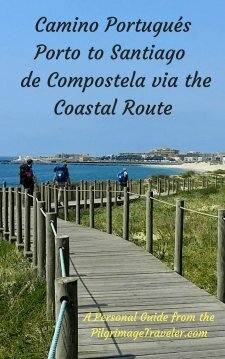 If this were true, we were more than a third of the way into our day three on the Camino Portugués. A good time for a break. 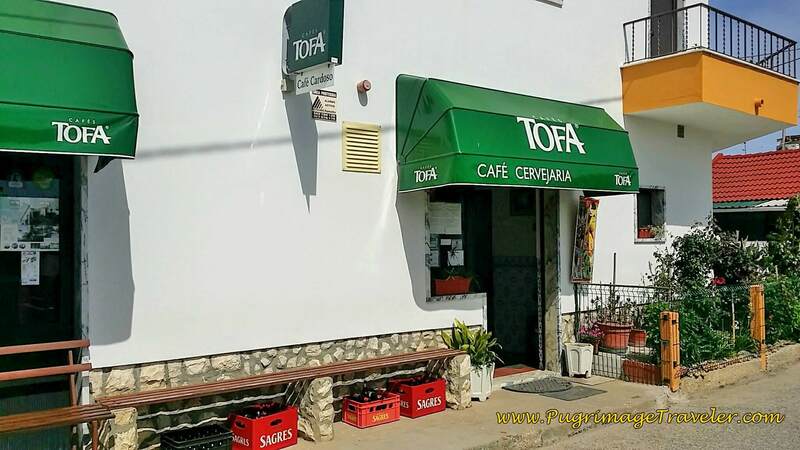 There are several cafés in Valada, and two of them were open when we walked through. 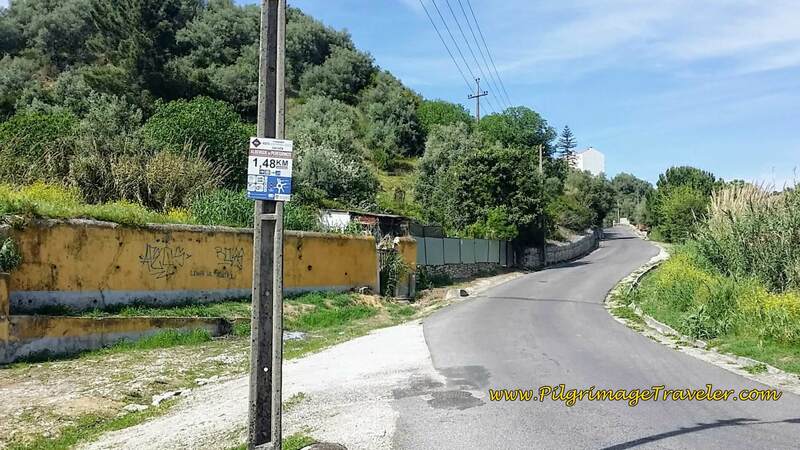 There are also two albergues in Valada. Consult the accommodation guide that I provided to see them. 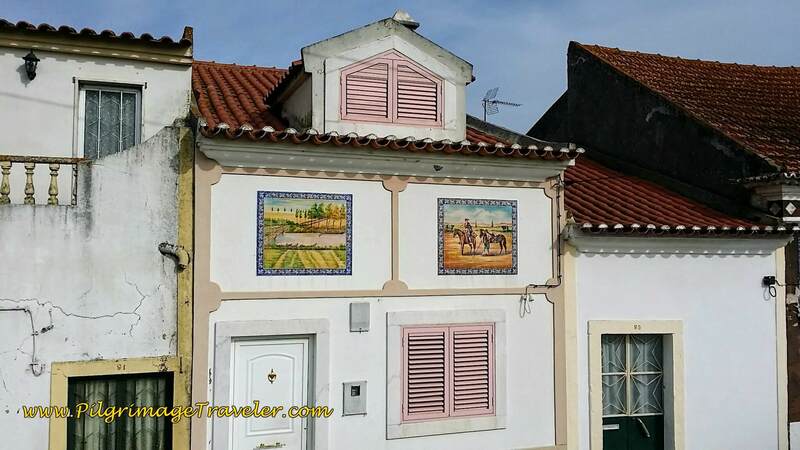 There is also the Casal das Areias, which comes highly recommended by pilgrims, if you wish to stay in a family-run hotel. The link will take you to booking.com. We stopped, here at the Mano Velho for iced tea and of course, café con leite. 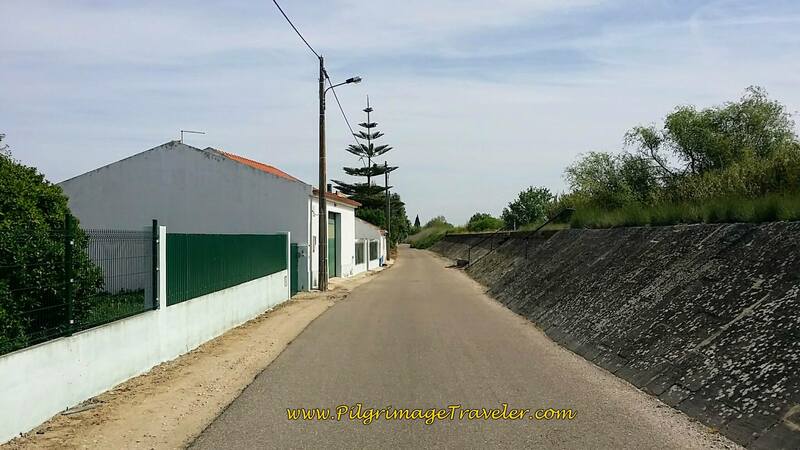 It was right along the Portuguese Way ~ very convenient and inviting. 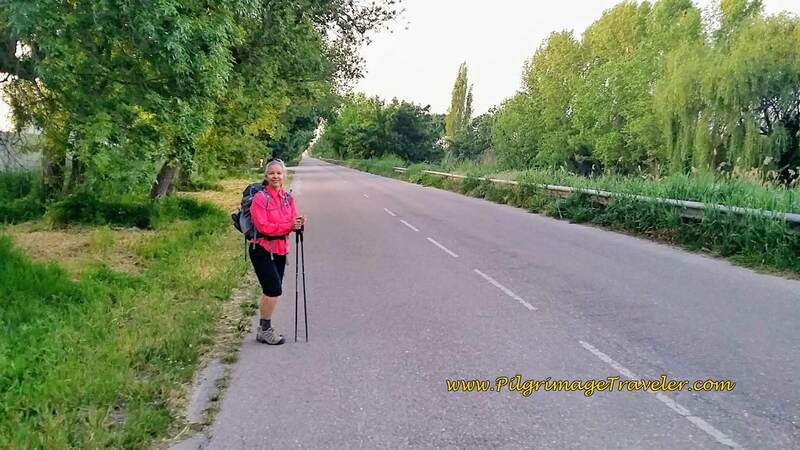 After our 30-minute break, we rejoined the route which continues to follow the dike along the river. 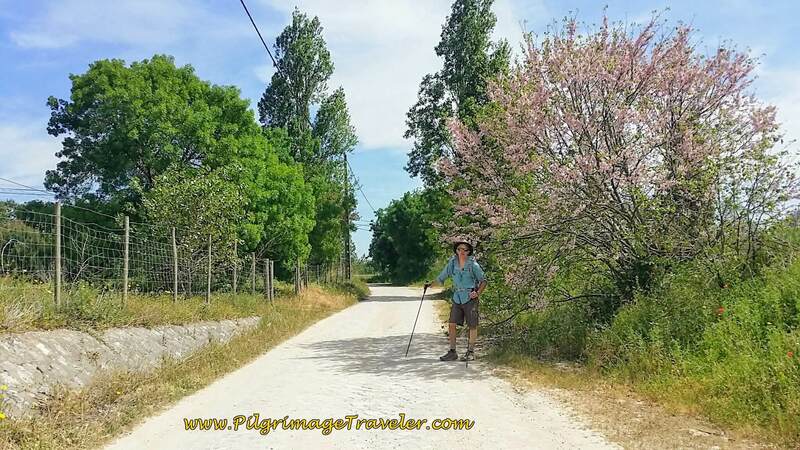 The paved Camino stones here were attractive, but a bit hard on the feet and legs. 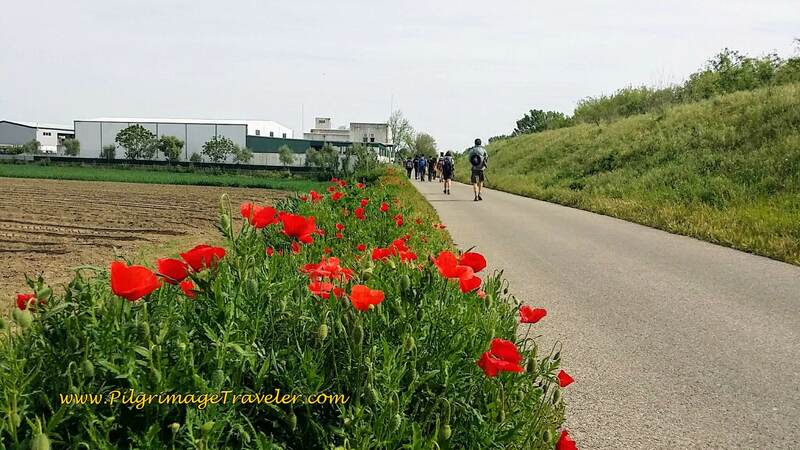 After Valada, the Camino eventually drops down off the dike and joins the road, with lovely wild poppies to grace the Way! 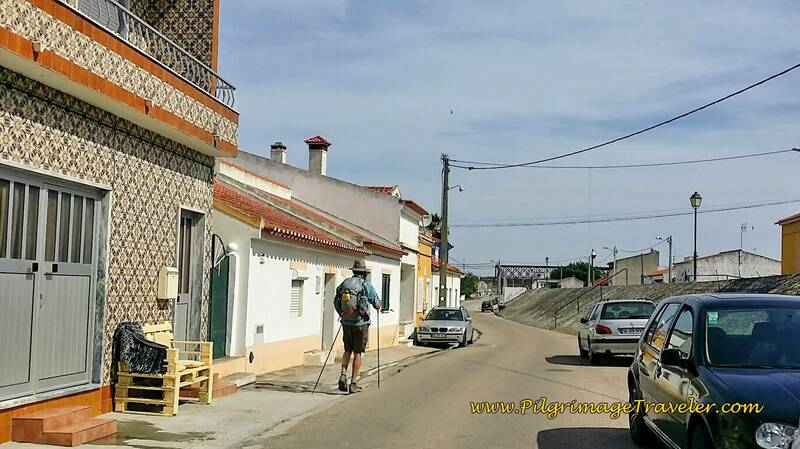 On day three of the Camino Portugués, we continued to follow the dike. as the streets become more rural and change from one name to another on the way to Porto Muge, the next and final large town. I loved the beautiful blue and white rowhouse along the way! 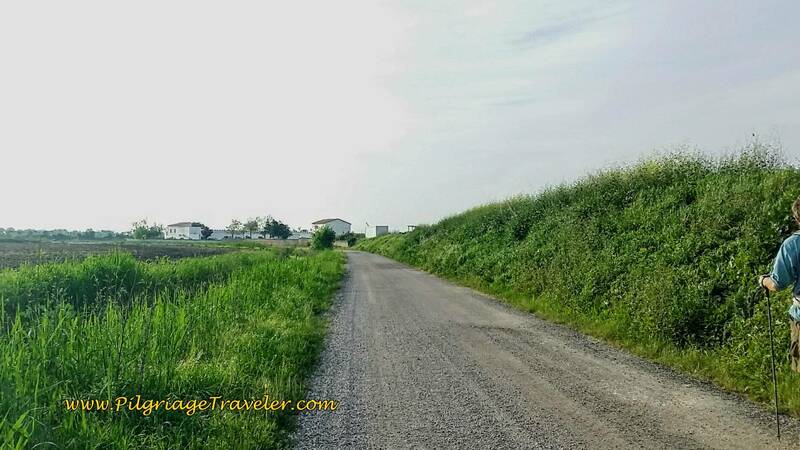 You know you are nearing Porto Muge when the houses are on both sides, and up on the dike! 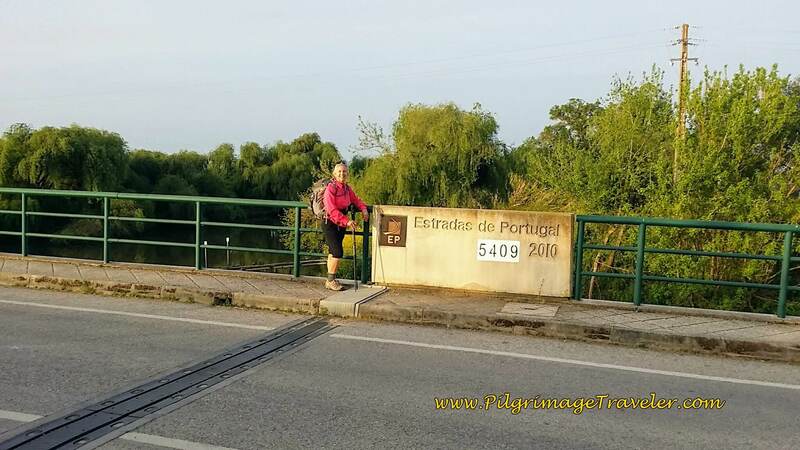 By the time you reach this bridge at Porto Muge, you are 17 kilometers into your day ~ halfway into day three on your Camino Portugués!There is accommodation here, if you chose to stay, and cafés. Perhaps the most important thing here, under the bridge is a small house, with restrooms! We both took advantage of that public feature. They are easy to see, right along the route which walks under the bridge. The only open café we actually saw was the Café Tofa, below, right after the Quinta das Palmeiras, in the photo above. 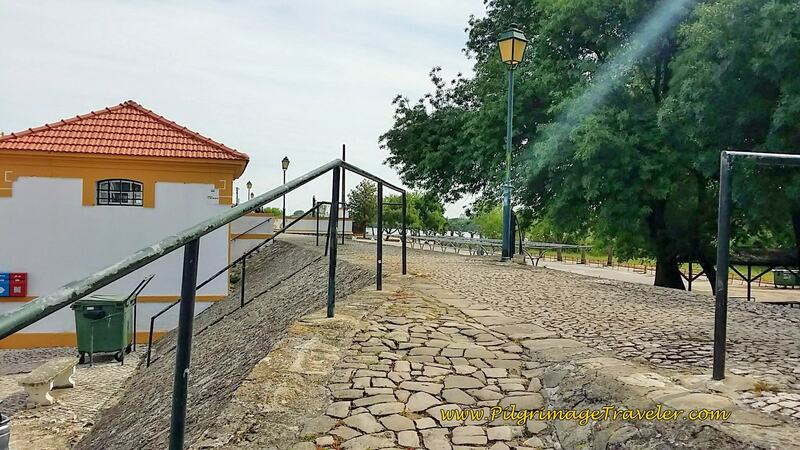 This is the last café before you get to Santarém, so consider this before you walk on by! It is a long, hot and dusty open road after this! 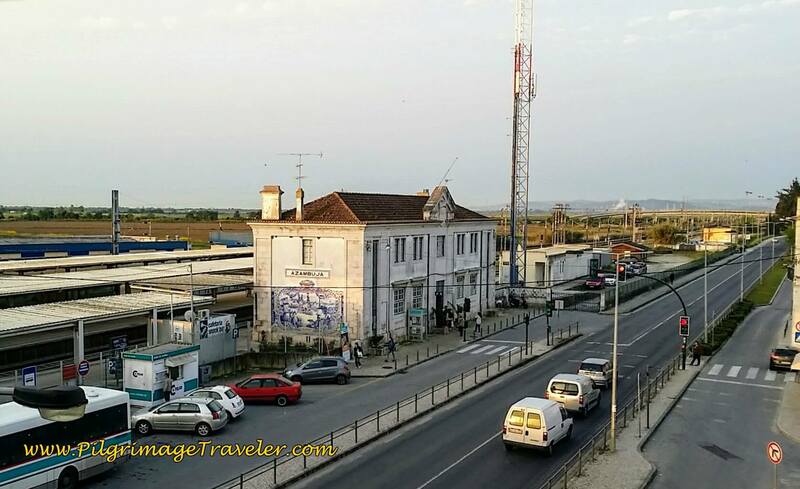 You are only halfway here at this café with a full 17 kilometers to Santarém. Since "cervejaria" means brewery, careful how much great beer you drink. 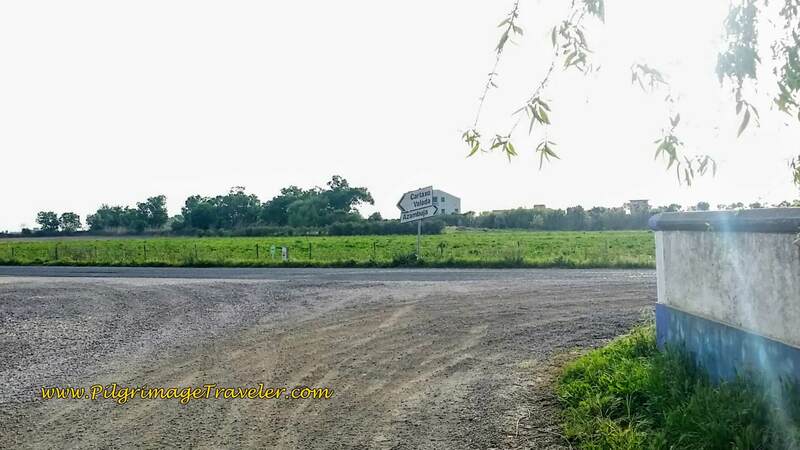 You WILL regret becoming dehydrated on this next stretch of road! We did not stop here, as we had food in our packs, and plenty of water for the rest of the day. It was about 11:30 when we left the Porto Muge area, and the day was already very, very hot. We walked on past the café along the Rua do Sabugueiro. Often we had a choice to walk up on the path on the dike, or on the street below. We found it to be cooler, and with a breeze from the higher path. 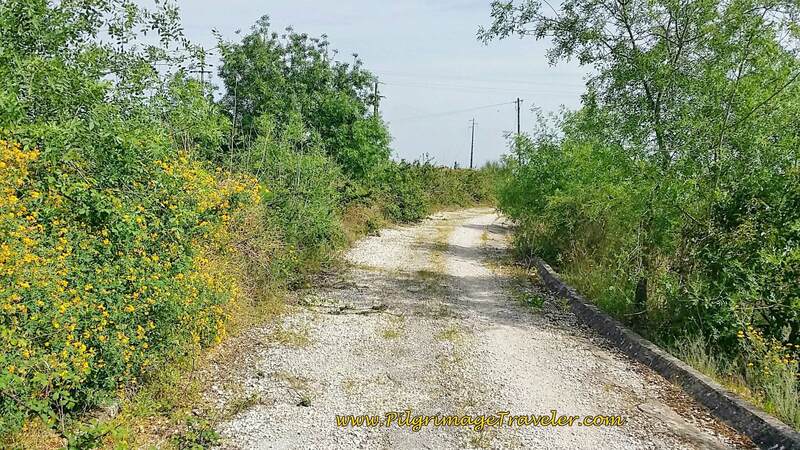 The paved road at last gives way to this dusty lane, heading into the farmland, at this old quinta, the Quinta da Burra. At least one guide lists a country hotel under this name, and a reader commented, below, on his stay here. Please scroll down to the comment if you wish to stay here! 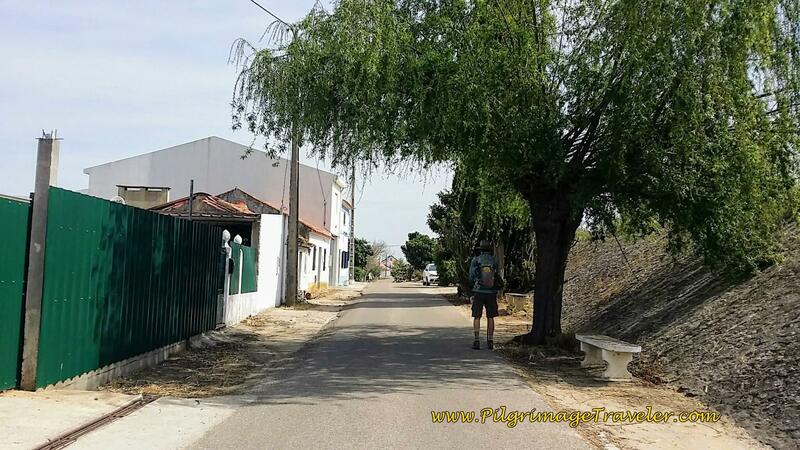 Where the road turns to dirt, there is about 12 kilometers left to Santarém on day three of the Camino Portugués. A man was peering out shyly, as we walked by, most likely waiting for pilgrims to enter. 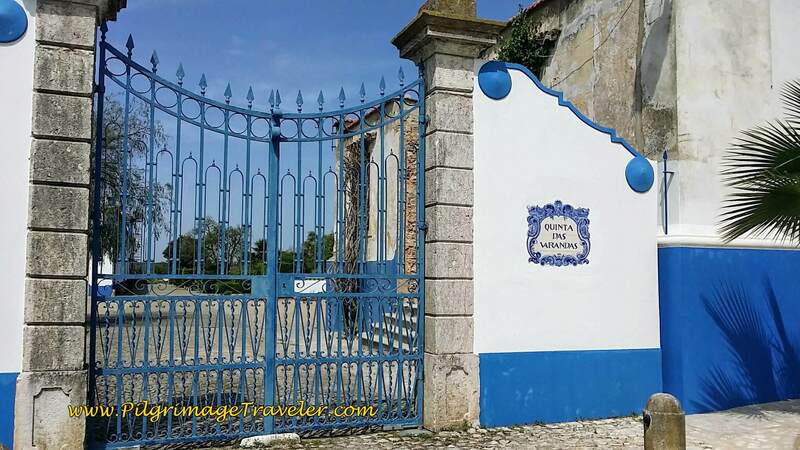 and walks past the lovely Quinta das Varandas, manor house on day three of the Camino Portugués. 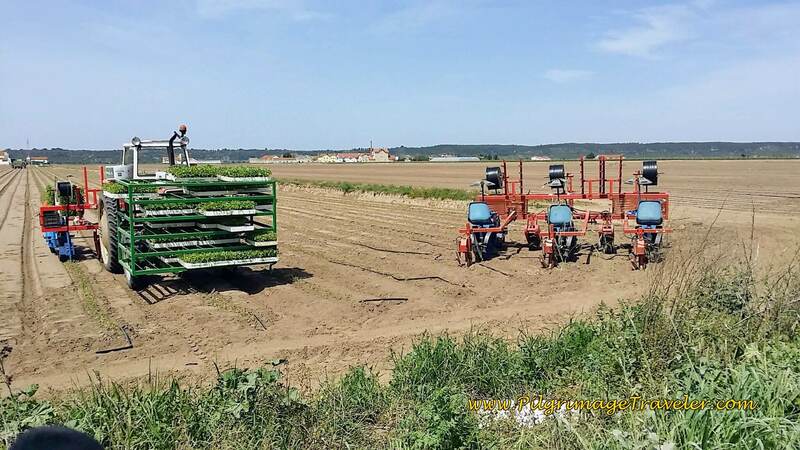 The farm workers were active along the way, planting these small plants from the blue chairs on the planting equipment to the right. Somewhere several kilometers into the long dusty lanes, at our 20 km point, we stopped for a picnic. We walked a ways until we found a shady area, in a field to eat the food that we had packed from our breakfast café. 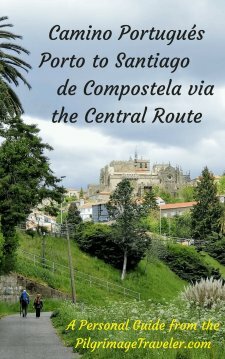 It was a nice big sandwich, and our Camino Mother had thrown in extra pastries, for no charge! A nice surprise and a nice, large meal with sweets to rejuvenate us and get us geared up for the last 14 km or so. We took a long break, airing out our tired and hot feet. It was mandatory, I thought, for the prevention of blisters. Despite the food, the stretch after lunch felt like a long, long way. We walked on in the heat for some time, just put our heads down, and tried to listened to music to escape. As the vista opened, we thought that it must be Santarém up ahead on the hill. Wow, did that look far away! By my best estimation, it was still at least 10 kilometers away when I shot this photo. Finally, at this juncture, below, where we arrived around 2:30 in the afternoon, all at once, the pilgrimage traveler can see the tall towers of a bridge ahead. This viaduct carries the superhighway, the A3 across the Río Tejo, just before Santarém. It gave us some hope, as perhaps Santarém was getter near! The day had grown brutally hot and I took out a bandana and wet it to put under my baseball cap, to help cool me down. It helped for only the few seconds it took the water to evaporate! But I was still grateful for the shade on my neck. 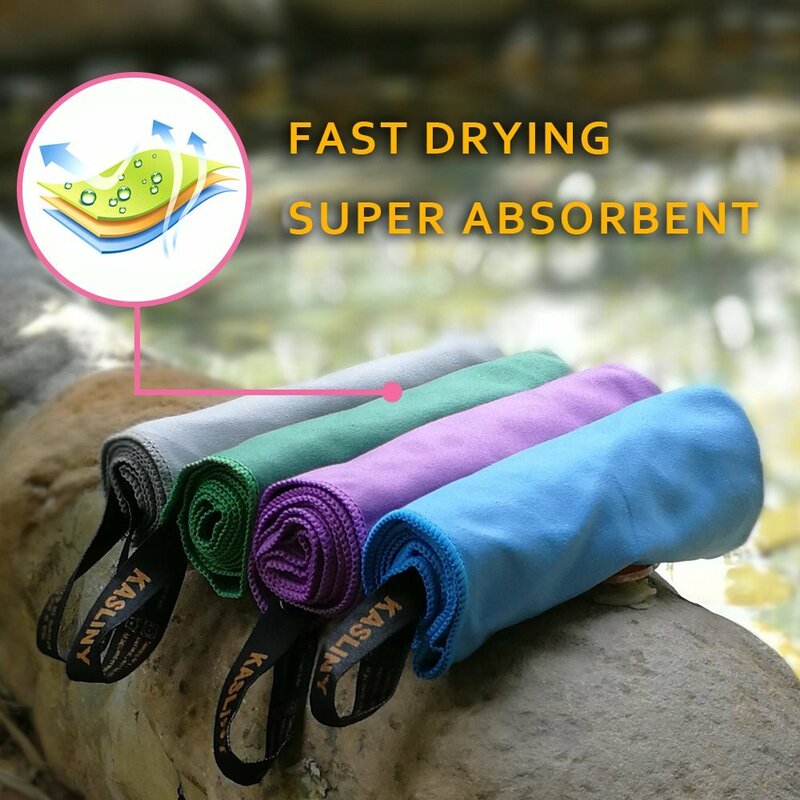 We fantasized about a sun umbrella. Didn't know how practical this would be? 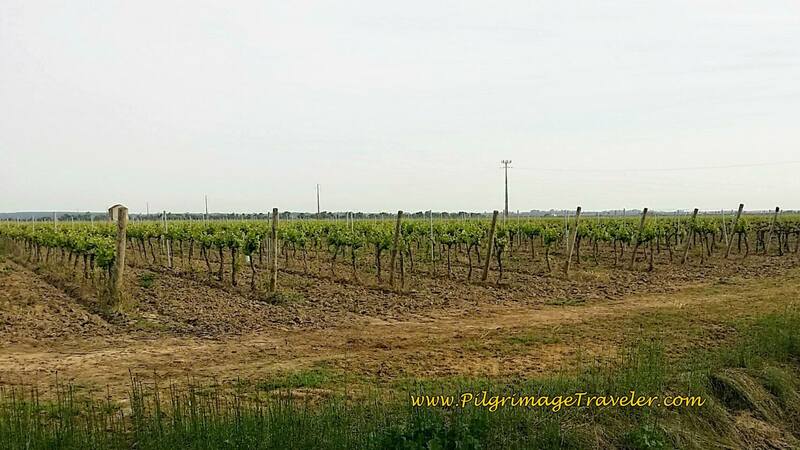 Out of nowhere, a young Spanish pilgrim caught up to us in the vineyards, and slowed down to only chat a bit. 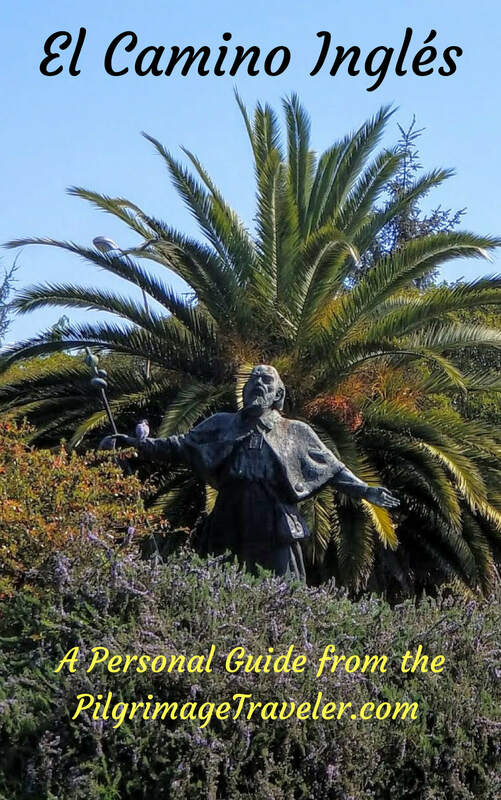 He was looking for a café, he told us that he had heard about in a town at the base of the hill to Santarém. He was wondering if we had heard of it. 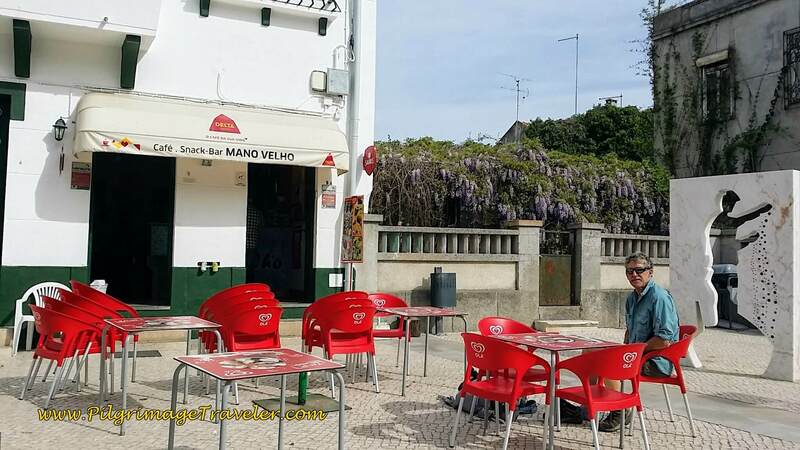 I was doubtful that he would find this café and as it turned out, we saw nothing in the town he was referring to (Ómnias) ~ there was nothing at all between Porto Muge and Santarém proper. 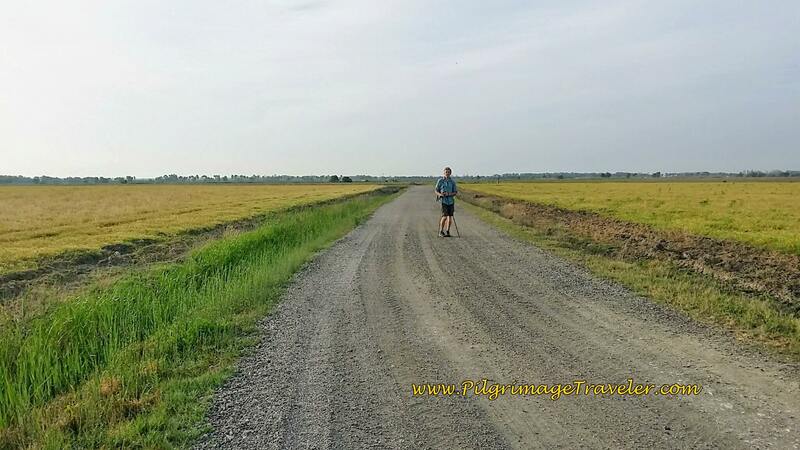 After our brief chat he quickly gained distance from us, as we struggled to walk faster in the brutal heat. It was just not happening! Slow and steady wins the race. 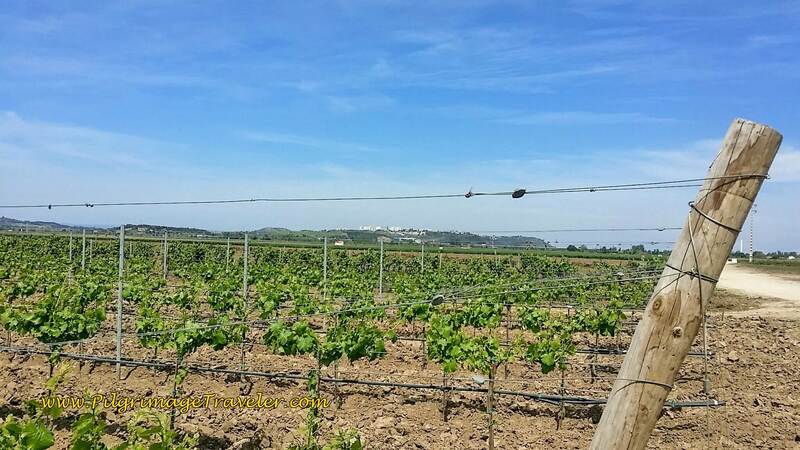 In the last 10 km we had gone through field after field of tomatoes and vineyards, passed quintas and old estates, many that were quite rundown. 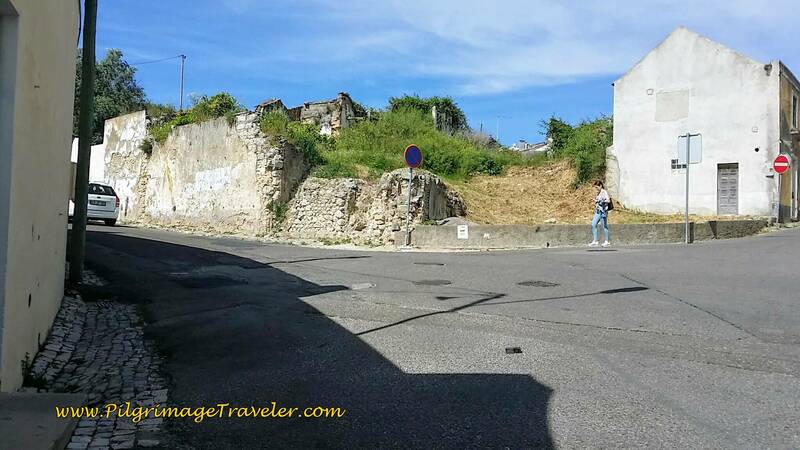 When you come to this T intersection, below, you are ending the portion of the Camino on the farmer's lanes. After turning right, above, you join this paved stone road, below. Yes, it is cobblestone. I thought my ankle was going to fall apart when I hit the uneven stones. We still had 4 km to go. I did make Rich stop for a breather, as I took this photo under the magnificent, spring-blooming tree. These last 4 km were the most difficult of all. I ran out of water here, but Rich managed to have some for me. Please be sure to carry plenty of water in this stretch. It was brutally hot in April. I imagined what it must be like in August. Nothing short of hell. 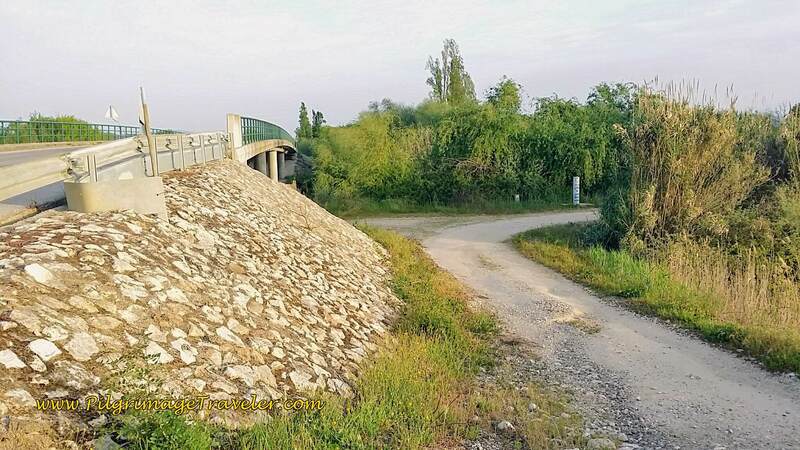 After walking under the superhighway viaduct, the paved road leads to Ómnias, below. In the heat of the day we saw no movement in this town. No cafés. We kept walking. Here is Rich looking quite disgusted at me for making him stop to snap this photo. The heat was making his mood foul. I wanted to capture the moment. The good, the bad, the ugly, as I promised. 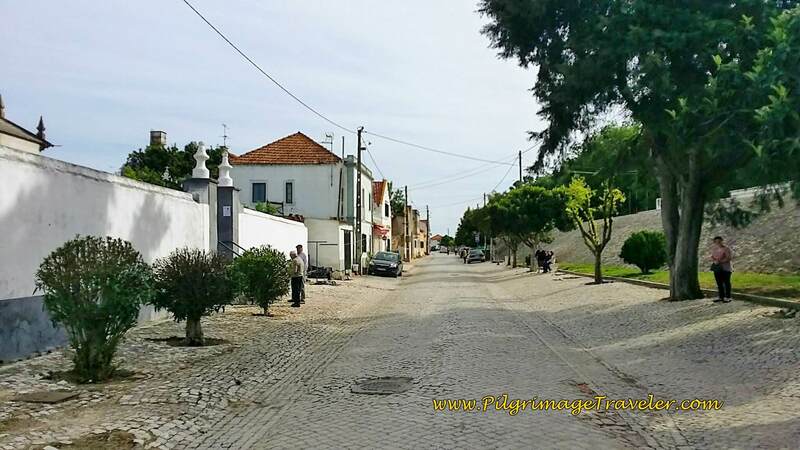 Just when we thought it couldn't get any tougher in the brutal heat, after about 30 km, the climb up the hill to Santarém began. While the photo looks serene below, we felt anything but serene. 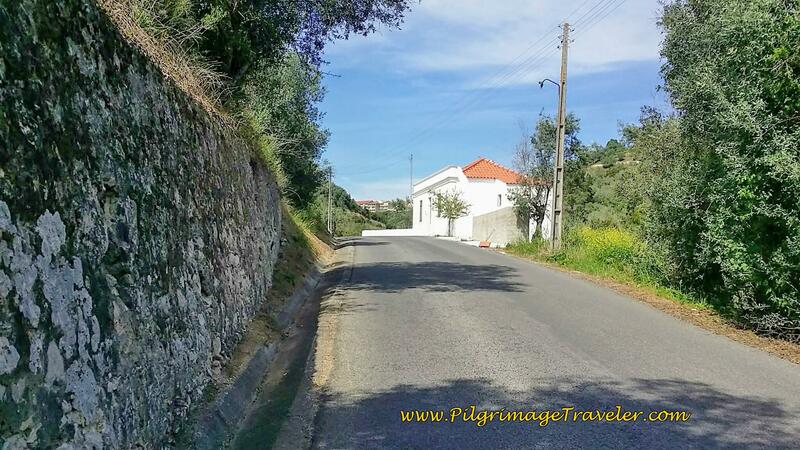 Continuing to walk up the hill, on the Calçada da Junqueira, we entered the city limits. At Last, Here the Signpost says, "Santarém"
We walked for what seemed like forever to the first open café and crashed into the first chairs. I ordered iced tea, and guzzled it down. The cold fluid was heaven after the hot water in our packs. 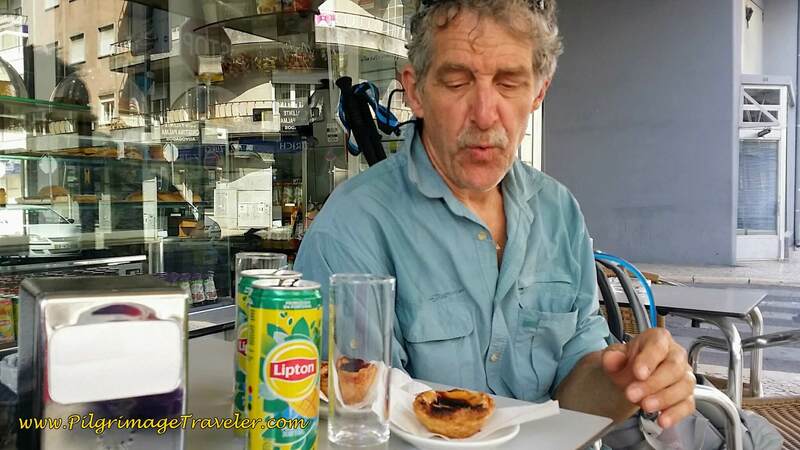 Then, of course, pastel de nata (cream tarts) to rejuvenate us as well! Here Rich is going for the gusto! He looks pretty ragged, doesn't he? I am so glad he did not snap a photo of me! After our break we set out to find our hotel. We had made loose plans to meet our Swiss friend at the Residencial Beirante where he was planning to stay, but after several attempts to call or text him, I could not connect. I was having trouble with the international connections and I wasn't sure what was wrong. 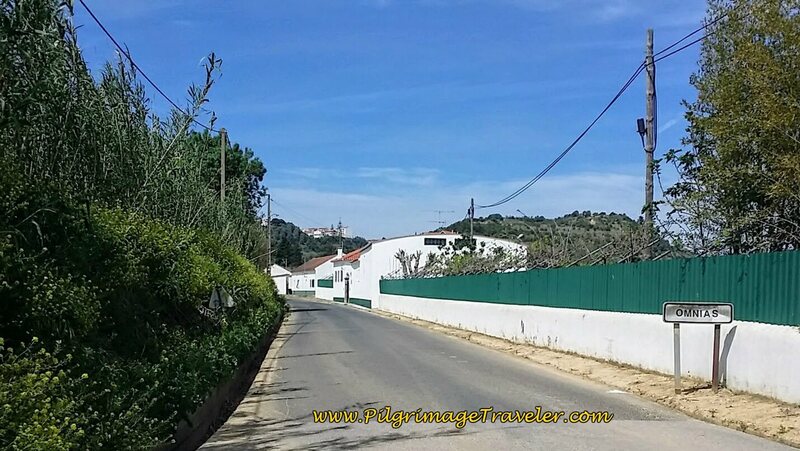 We walked through town, by the main traffic circle, (where the actual Camino goes to the right, refer to day four and see my Google map above) and past the Igreja (church) de Nossa Senhora da Piedade, to the left of the photo, below, and just beyond the Igreja De Marvila, to the right, below. 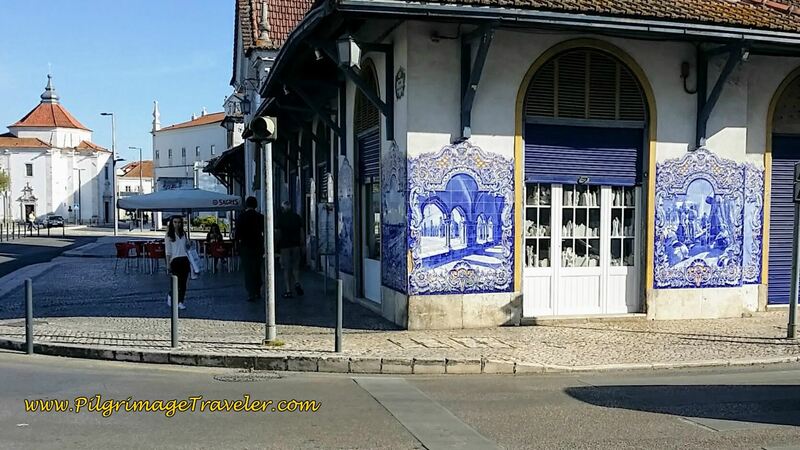 This beautiful blue tile building has been converted to a marketplace. 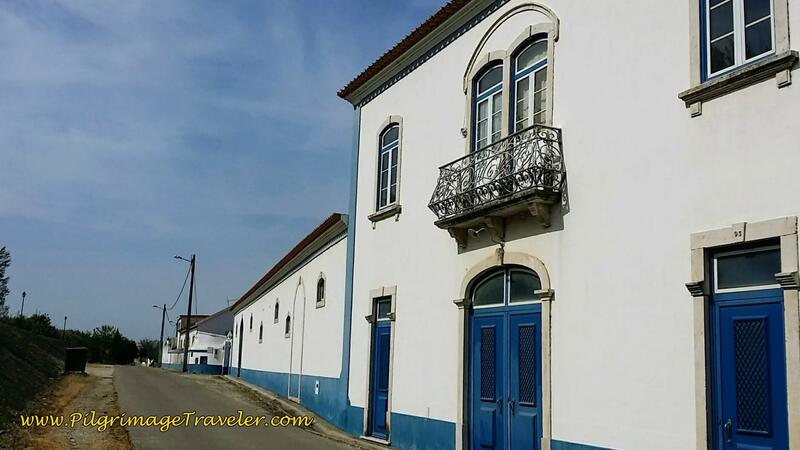 It was just beyond this market building that we found the Residencial Beirante on the Rua Alexandre Herculano. 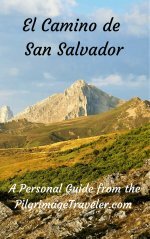 While this small hotel isn't listed on booking.com, there are many that are, if you wish to book ahead. Just click here. While the Beirante doesn't get a lot of rave reviews, we found it to be acceptable, included in the price of 30 Euro for a double room, a huge breakfast at 7:00 a.m. the next day which was quite nice to start off our day four. As fate would have it, we ran into our Swiss friend at the Residencial as we were checking in! When we realized we would not be able to call or text in the conventional manner, we set up WhatsApp to communicate over wifi, in the future. We agreed to regroup, and meet up in a few hours for dinner. Rich and I cleaned up and walked around the town for a bit. 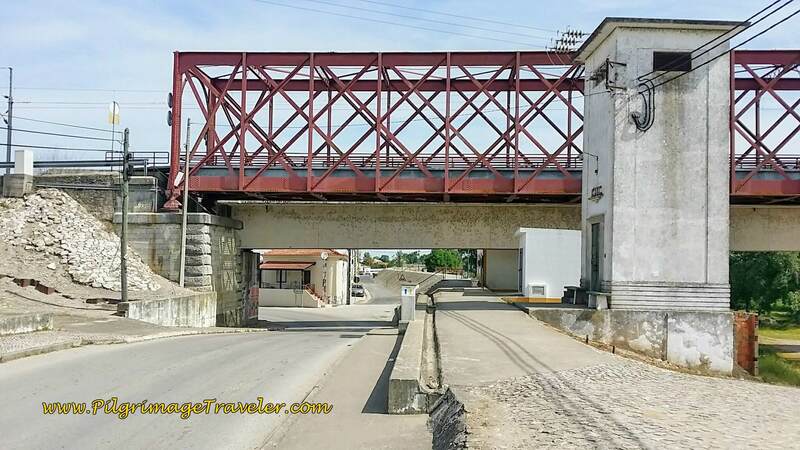 The town of Santarém is lovely. It would actually be worth it to spend a rest day here, as our Swiss friend did. 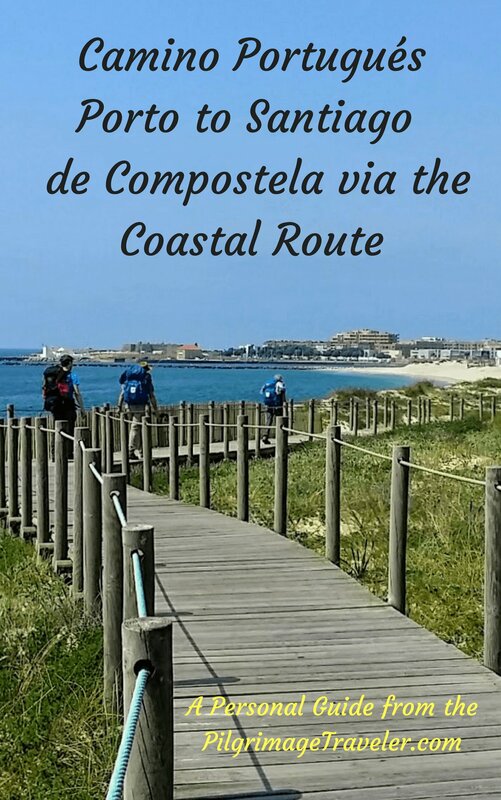 We chose the Restaurante Caravela for dinner, see map, and we had a lovely pork dish, sauteed in butter and garlic, with rice, chips and a salad. It was a perfect and hearty meal for a pilgrim. As we conversed over dinner, our Swiss friend finally confessed that he had a blister on his one little toe. He wouldn't discuss the severity of it, and when I offered to treat it (I am a nurse) he said he was fine, and would take the subject no further. He agreed that he realized that his feet were swelling and his boots were indeed, too tight. He did, however, want to join us again in the morning for the next day's walk. Ahh, yes, it was indeed my fate to help the Barnacle, in whatever fashion he would allow. Unable to state that we preferred to walk alone, I accepted that it was our task perhaps, to help him learn how to be a pilgrim. After imbibing in lots of Portuguese wine with dinner, I realized that there was little light left in the day, and I wished to see the famous Portas do Sol at sunset. I asserted the partying gentlemen that I was going to the look-out now, that they would have to settle the account when they finished their wine, as I raced away from the table. Knowing myself, as in the above quote from Eric Clapton, served me well today. 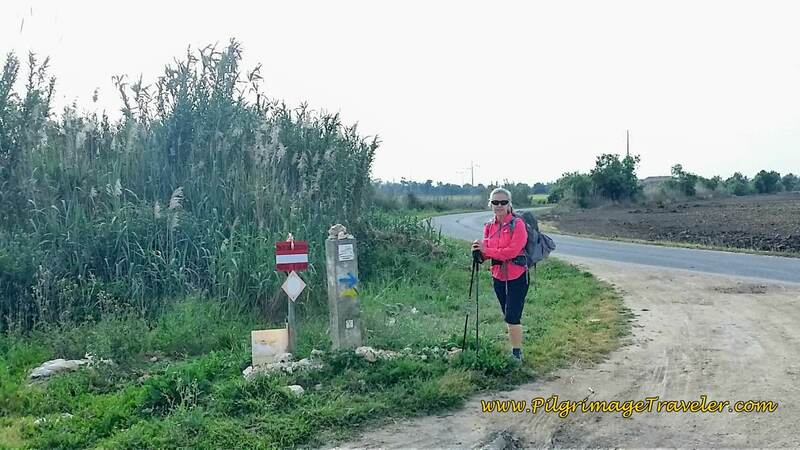 Knowing that I can indeed, as an experienced pilgrim, reach down deep to do what needed to be done to walk the entire route on day three brought me comfort and a sense of accomplishment at the end of the day. 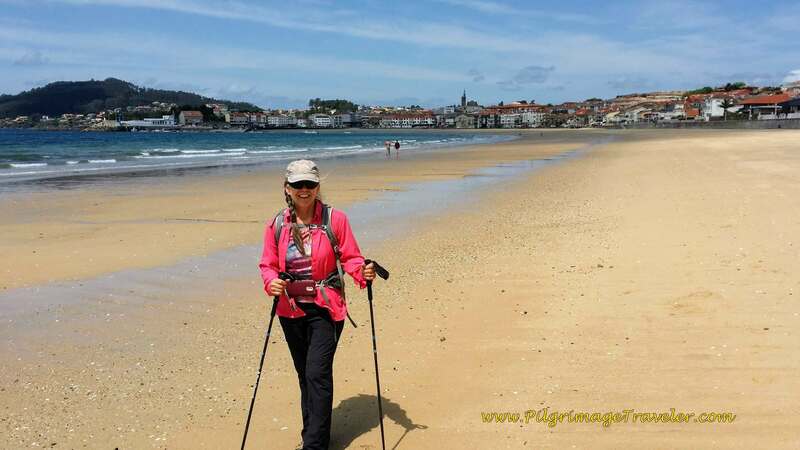 Day three on the Camino Portugués could have been worse. It could have been a mud slog in pouring down rain! Or we could have had issues like the wildfires impeding the route, as what had tragically occurred later in 2017. While the heat was torture, walking slowly and steadily while drinking lots of water, got it done. I could still do it. A full 34 kilometers. 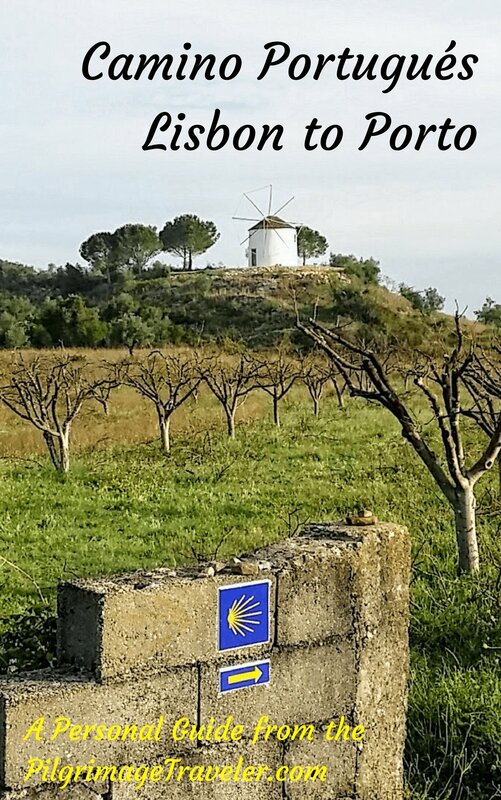 I had also renewed my life's commitment to do what I could to help others ~ in this case our Swiss friend as he learned how to become a pilgrim. What I knew about myself is that with him, the approach had to be tender, kind and suggestive, instead of direct and instructional. I believed I was up for the challenge. 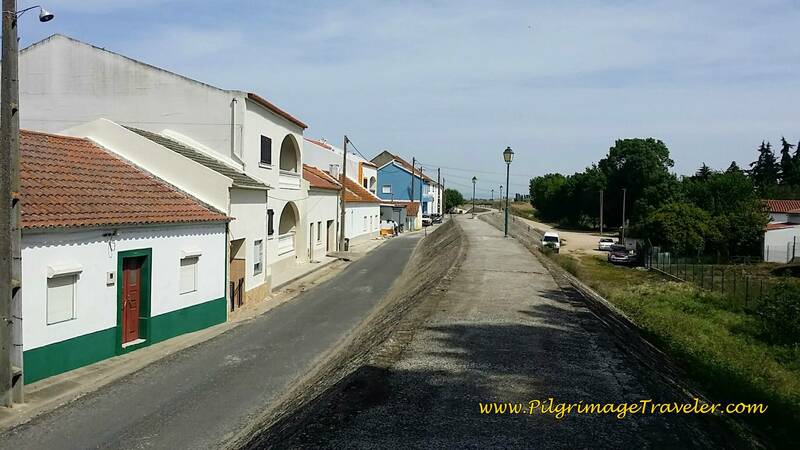 On this day three of our Camino Portugués, with Rich and I examining our values and our strengths, we knew that we both had what it took to be examples on how to be pilgrims and how to help those who chose to be helped. 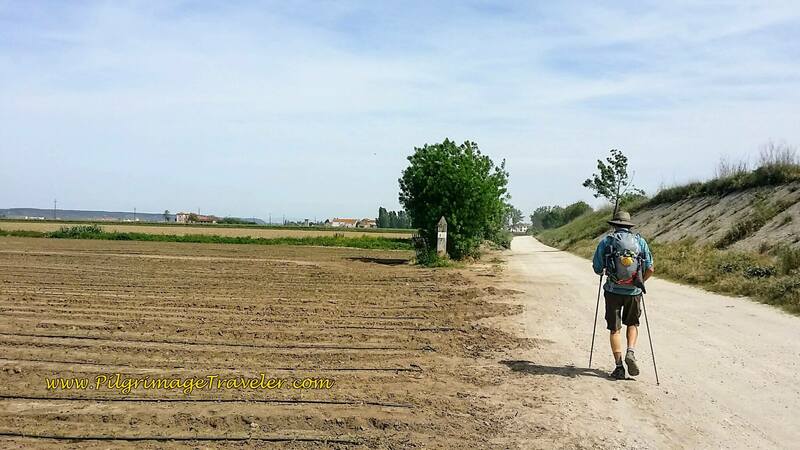 Despite our friend's struggles, he was hoping to orchestrate our Camino as well as his own. 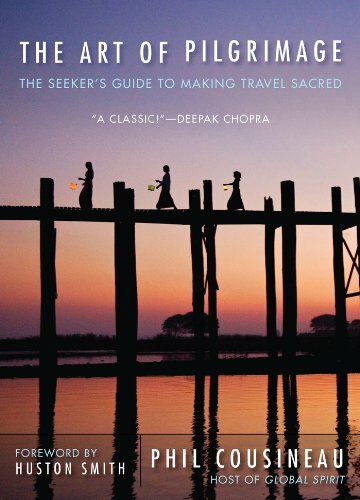 I also learned that I can assert my own self, my own Camino, to do what I had to do to walk my own pilgrimage. 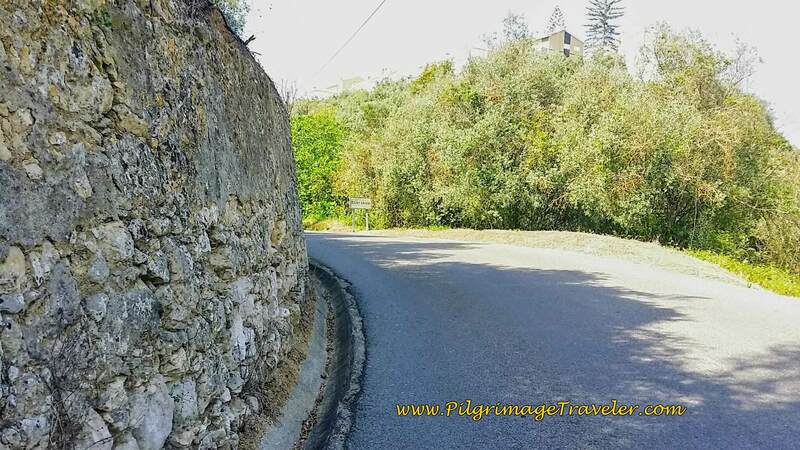 I had subtly stated at dinner that we were no longer going to stay in hotels, but that to meet other pilgrims, if we had the choice, we needed to stay in albergues. Because the Barnacle, was just that, a Barnacle, he agreed to try an albergue the next night. 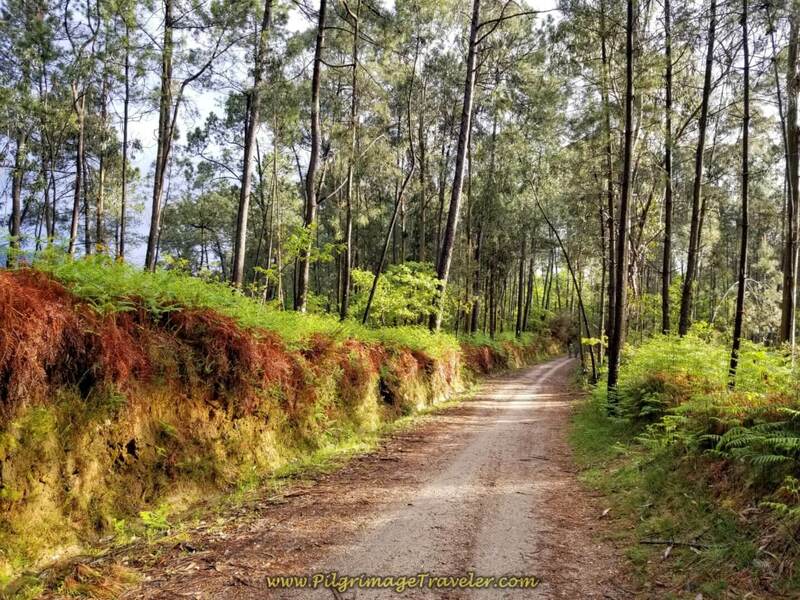 While I was not sure if a walking pilgrimage through Portugal was our Swiss friend's idea for gaining self-knowledge, what lay in store for us traveling together was yet to be determined. If the Barnacle was still attached, so be it. 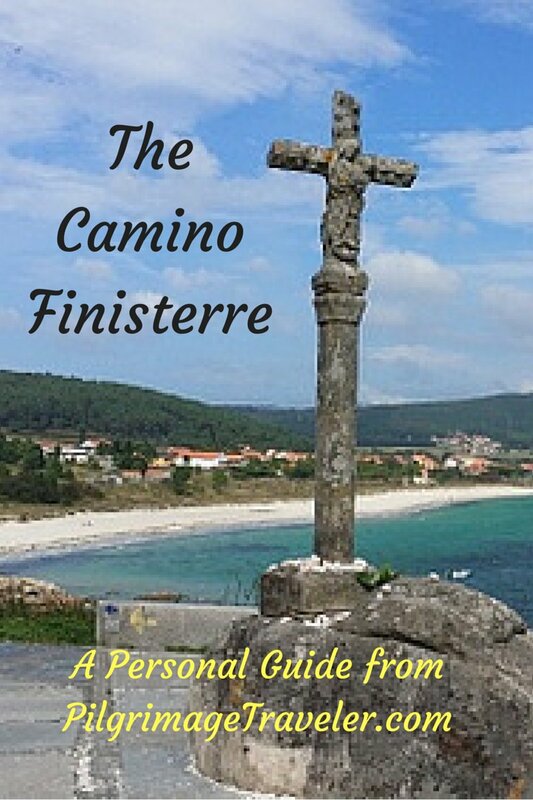 May your own day three on the Camino Portugués be full of self-examination and self-knowing as you become the best pilgrimage traveler that you can be! As it has been said, if you want to know God, get to know yourself! Ultreia!